On Feb. 18, outraged community members marched to the Tustin, Calif. City Hall to attend the City Council meeting and demand answers in the death of 23-year-old Robert Villa at the hands of Tustin Police on Feb. 10. Villa was shot simultaneously by four police officers, who later claimed he was holding a knife (a claim disputed by all witnesses). 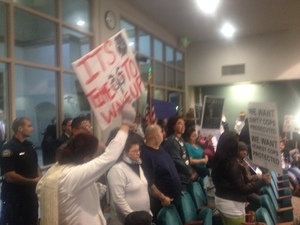 As the Tustin City Council hid in their chambers, delaying the start of the meeting, community members took turns making impromptu speeches against the police. One 7-year-old Latino boy who lives in the area screamed at police officers “How come you guys always harass me when I’m playing with my toy guns? Why do you always roll up on me and my friends, we didn’t do anything to you? ” His impassioned account evoked the recent police murder of Andy Lopez, a 13-year-old Latino boy playing with a toy gun in Santa Rosa, Calif. The City Council finally began the meeting, informing the audience that there were some other agenda points to get through before they could address the killing of Robert. Then began a slew of awards and videos glorifying the Tustin Police for “saving” people in the community. After several pro-cop presentations, Tustin Mayor Al Murray announced they would begin the discussion on Robert Villa. He called up Police Chief Charles Celano, who began reading the bogus police account of events—within the first few seconds, he stated as a fact that Robert was armed with a knife, even though every single witness has testified to the fact that he was completely unarmed. Outraged at the spectacle, Leticia Villa broke down; “You’re going to make me sit here and listen to these lies all over again?” she screamed through tears. Others began chanting in support of Robert’s mother, demanding that she be allowed to speak instead of the police. After failing to quiet the crowd to allow the police chief to finish, the mayor called a recess. Leticia began speaking anyway. The room became silent as she began reading an emotional tribute to her son. As she was reading it, every City Council member turned their backs on her and walked out of the room. They returned shortly after and announced that they would not have the police chief finish his account of the incident, and opened the floor to public comment. More than a dozen family members, Tustin residents and activists spoke in the meeting. The action was heavily covered in the local press, with two local TV stations covering the outrage at the meeting. Actions are scheduled to continue as the Tustin Police have so far refused to release any names of involved officers or details of their investigation. But the tone was set Tuesday by the people who united to put the heat on the city officials in the name of justice for Robert Villa.